All islands of St Petersburg are diverse, unique and come with a fascinating history ready to be discovered. Some of them are populated islands separated from one another by straight rivers and canals and linked by elegant bridges, which are sights of their own. Others are unpopulated islands and not linked, but easily reachable by boat. So yes, as you read, the city of St. Petersburg was literally built on islands, or to be more accurate, on beautiful islands. That's why some people used to call it the city on 101 islands. Although, as a result of engineering work to develop the marine façade the number of islands was reduced from 101 to 42 in the early 20th century. 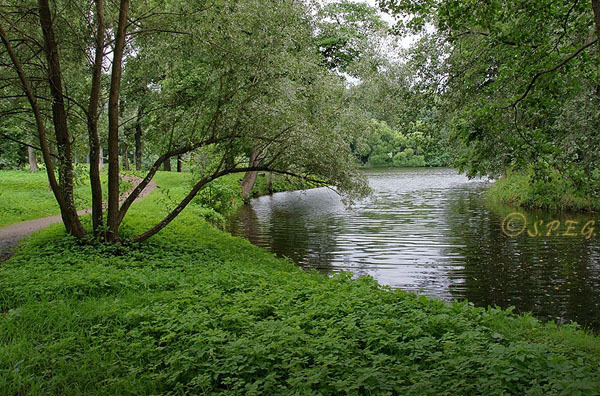 That said, the islands of St Petersburg can be divided into two groups: natural and artificial. Natural islands are formed by arms of the Neva River, for example: Vasilievsky Island, Petrogradsky Island and the other big islands. In comparison, artificial islands are small and uninhabited; the only one worth seeing is the New Holland Island created by Peter the Great in 1721. Visiting some of the islands of St Petersburg is particularly interesting to visitors exploring the city because they remain largely unchanged since old imperial times. They all have a distinctive character and unique historic functions that make these cultural oases worth a visit, but only during the Summer time. With more than 42 islands it will be hard for you to visit them all, and honestly not all St Petersburg islands are interesting or open to the public because some are just nominal islands. Therefore, we have summed up what we think are the best islands of the city, so you know which one you should explore. TIP: If you would like to see where the Tsars lived during the Summer time, then you should visit the Kirov Islands, a collective name given to the three most famous outer delta islands located on Petrograd Side: Kamenny Island, Yelagin Island and Krestovsky Island. Instead the island no one should miss is Hare Island where the Peter and Paul Fortress's and Cathedral was built. Zayachy Island - The little Hare Island in St. Petersburg Russia. Hare Island (Zayachy Island in Russian) is the first island where Peter the Great planned to lay the foundations of the first structure of the city “Sankt-Piterburkh” : the famous Peter and Paul fortress. 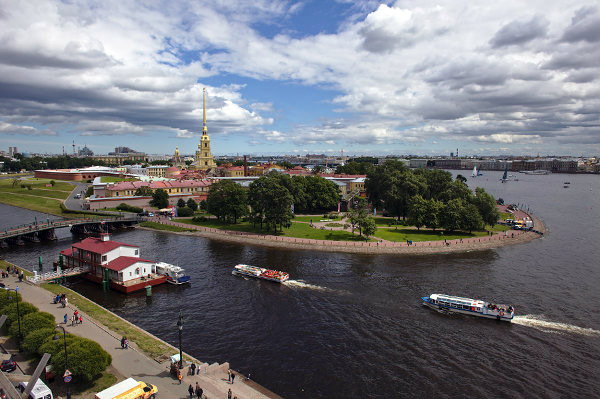 Today, across the Neva River from the Winter Palace, the small Hare Island offers fabulous picturesque views of the city's historical center and the large Neva River, Bolshaya Neva and Malaya Neva. A visit to Hare Island is a must if you wish to explore the Peter and Paul Fortress and see the city from another side. The New Holand Island in St. Petersburg Russia. 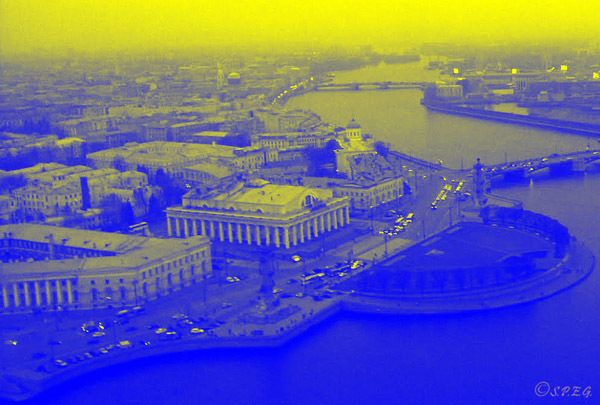 The New Holland, an artificial 19-acre triangular island located in the centre of the city, was created by Peter the Great as the first arsenal for his fleet of military ships. For many years during the Soviet period it was inaccessible, and this spawned a myriad of legends about what might lie beyond the red bricks. Now, the island is finally open to the public and is considered one of the most romantic corners of the Northern Capital. So you can get through that magnificent red wall and see a new hidden treasure, but only during the summer. Panoramic view of Vasilyevsky Island. Vasilievsky Island is one of the largest islands of St Petersburg and one of the most beautiful districts in the city, especially along the eastern edge of the island and University Embankment. Developed in the 19th century, the island became a middle-class haven featuring broad tree-lined avenues, attractive classicism style architecture and several Lutheran churches. Home to some of St Petersburg's most famous buildings and organizations, the island is considered a center of education as it houses the main St Petersburg University. It is also an important gateway for cruise ships as the Marine Facade Port is located on the island. You can learn a bit more about this Island Here. 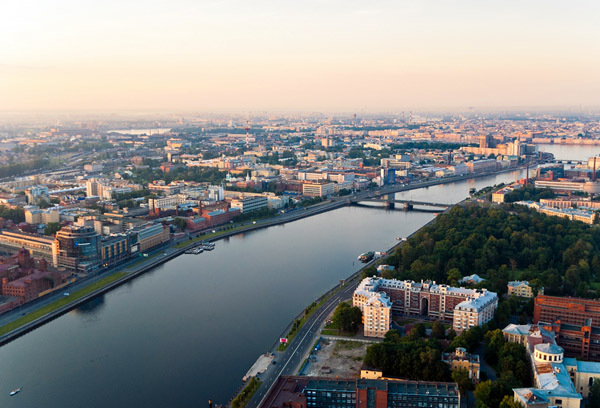 Panoramic view of Aptekarsky Island in St. Petersburg Russia. With vast green areas, several attractive residential buildings and connections with Russia’s most well-known scientists, Aptekarsky Island has an interesting history. Once used as the headquarter for the medical office and later on as an botanical garden to provide the city with medicinal herbs, Aptekarsky Island today is an extension of the Petrograd Side and an attractive residential area. The island hosts a revamped imperial Botanical Garden, which contains over 7,500 different species of plants from around the world. Krestovsky Island in St. Petersburg Russia. Krestovsky Island, the biggest of the three Kirov Islands of St Petersburg, stands north of the Petrograd Side in the Neva delta and consists mostly of the vast seaside Victory Park. Defined since its foundation as a popular leisure venue where anyone can enjoy recreational activities, such as cycling, rollerblading, jogging and much more. Nowadays it has a growing number of urban beach restaurants and night clubs, so it is particularly busy during the summer as it has become a lively spot to hang out and have fun for the youngest. Kamenny Island in St. Petersburg Russia. Famous for its classical Kamennoostrovskiy Palace, the surrounding park and the Gothic Church of the Nativity of John the Baptist, Kamenny Island is one of the most picturesque islands in St Petersburg and one of the most rarely visited by tourists. 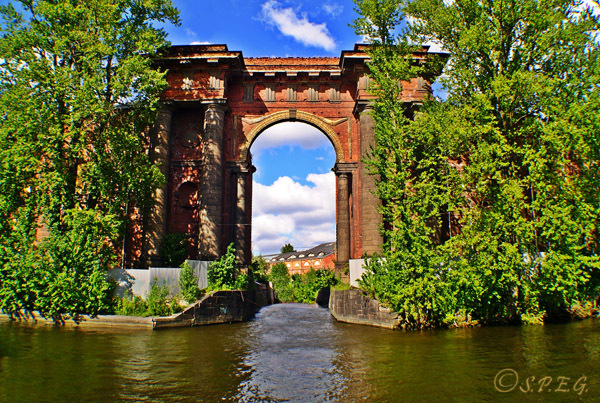 Also known as the Stone Island, this wooden site is punctuated by a series of canals, lakes and ponds, and is pleasant for strolling any time of year with its overgrown pathways that hide some truly beautiful buildings. This is definitely a delightful site to explore if you are looking for a taste of nature. Yelagin Island in St. Petersburg Russia. While Krestovsky Island is the largest and liveliest of Kirov Islands and Kamenny Island is the most natural and peaceful, Yelagin Island is the most pleasant of the three. 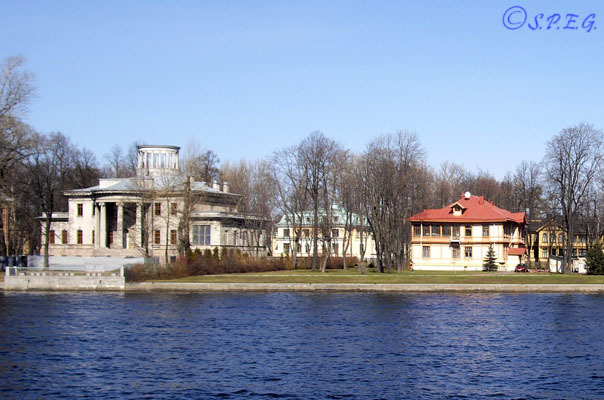 The island houses the summer palace of the tsars, Elagin Palace, which hosts a nice museum inside. 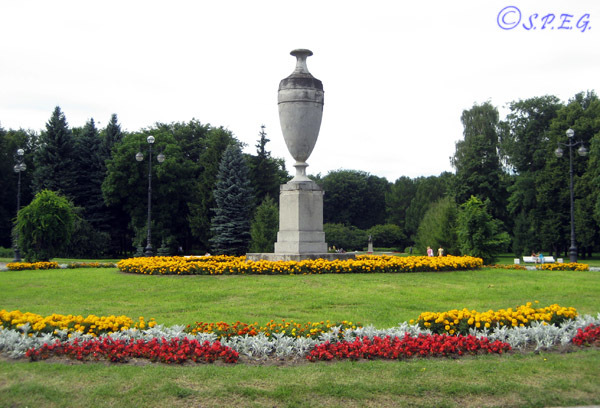 While the palace and museum are the main attractions, you can also enjoy a stroll through the vast green paths, lakes and ponds which are spread out across the Kirov Central Culture and Leisure Park situated on the island. A view of Kotlin Island in St. Petersburg Russia. The Kotlin Island, located near the head of the Gulf of Finland, was opened to visitors in the mid-1990s and is Russia's most venerable naval port where the active town Kronshtadt lies with its 43,000 inhabitants. Although it has a slightly different look than it did in its heyday as the headquarters of the Russian Baltic Fleet, this small Russian town still holds its gloomy communist facade. Surrounded by many old surviving forts, the island, along with its impressive Naval Cathedral of St Nicholas and several decaying soviet buildings, is one of the most intriguing islands of St Petersburg and not yet popular among visitors. 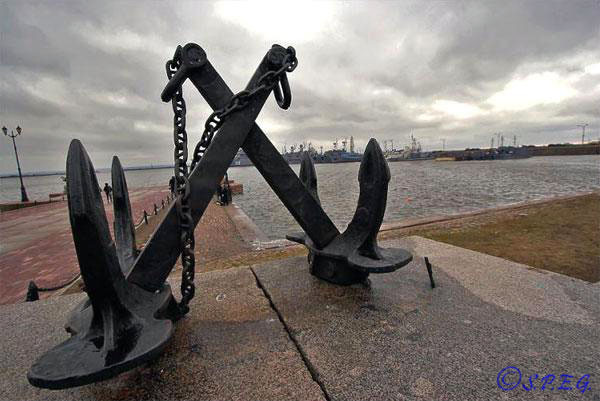 Would you like to visit one of the Islands of St Petersburg listed on this page?